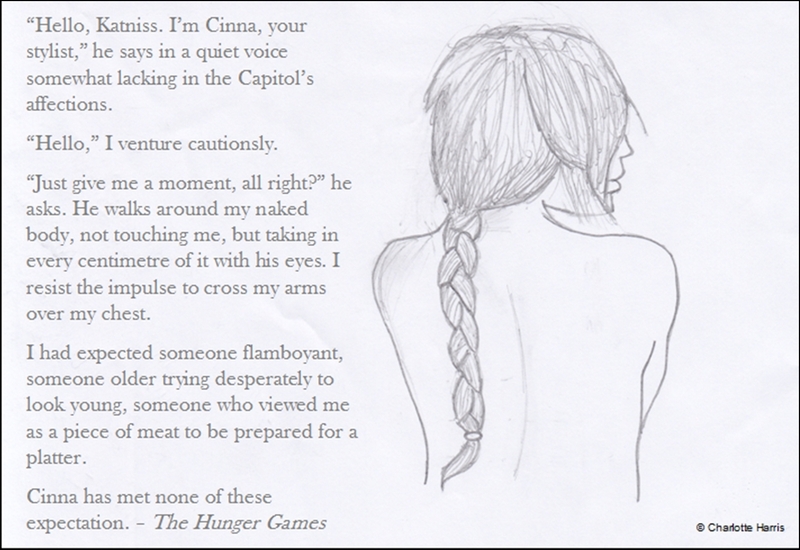 Katniss Meets Cinna. This is when Katniss meets Cinna her stylist for the first time.. HD Wallpaper and background images in the Hunger Games club tagged: the hunger games katniss the games hunger everdeen cinna. This is when Katniss meets Cinna her stylist for the first time. This Hunger Games fan art might contain anime, bande dessinée, manga, and dessin animé. Hi, could people please give me some comments cos im taking art GCSE and i need some thoughts on my drawing. Thanks guys! I like it, but if you want a real critique, maybe a something harder to draw? Katniss from the front? The profile looks a bit squashed, but its hard to tell. cksback if he drew katniss from the front, shed be naked you know. she IS naked..just read the third sentence of the second paragraph..
id rather see the front............ good art though.